Please find below various Village zoning, development, and floodplain-related documents. The maps displayed on this website are for reference purposes only. All zoning district information should be verified using the Village’s Official Zoning Map. 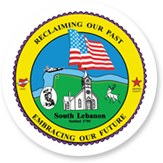 All floodway and floodplain information should be verified using the current Federal Emergency Management Agency’s (FEMA) Village of South Lebanon Flood Insurance Rate Map (FIRM) (revised October 18, 1994). The Village’s adopted and signed, Official Zoning Map and applicable FIRM is on file and available for public viewing at Village Hall, in the office of the Fiscal Officer.